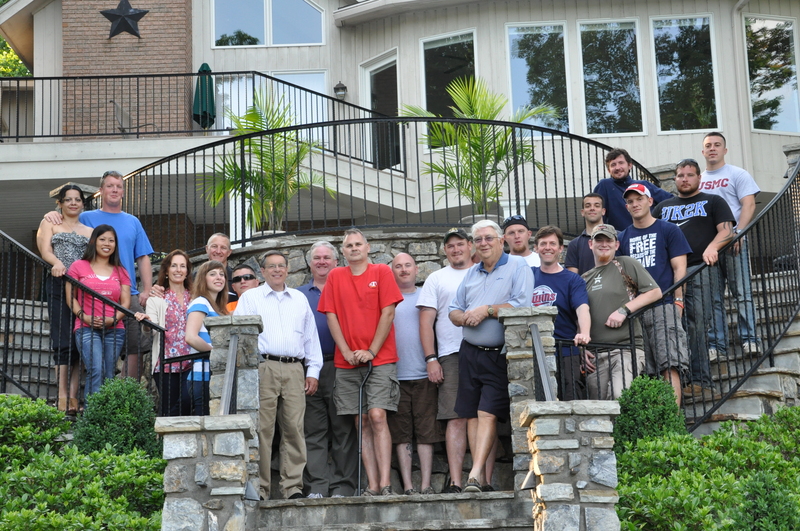 On the eve of Memorial Day, the Smith Mountain Lake community welcomed a dozen disabled veterans for an opportune getaway. It was an active and yet restorative three days of fishing, shooting, competition, and fraternity. Upon commencement, members of East Lake Church and their pastor, John Keaton, cheered their visiting heroes and presented them with fresh-baked refreshments and a cake, decorated in patriotic colors, with the message, “God Bless and Thank You for Your Service.” Pastor Keaton told us about his brother Brian, who was recovering from surgery for the traumatic brain injury (TBI) he sustained while deployed in Afghanistan. 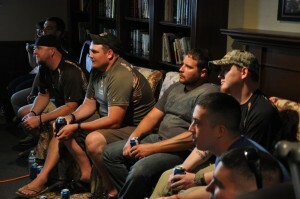 Keaton was privileged to honor his brother and the other soldiers by inaugurating the event with a special benediction. One member of the congregation, Mark “Mac” Mackenzie, is an Air Force colonel and was an F-15 Strike Eagle pilot. 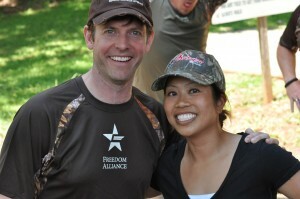 He and another Smith Mountain Lake local heard about Freedom Alliance and were keen to volunteer for the event. Mac will be retiring soon, and he intends to use his combat experience and faith to minister to other veterans. The next day kicked off with an early wake-up call by “Doc” Harrold, a Navy corpsman who rallied the troops to the boats. Thanks to the Smith Mountain Striper Club and its president, Bob Rowe, each service member was outfitted with their own vessel—complete with captain and first mate. The 12-boat fleet launched into the lake at 6:30 a.m. The stripers and bass were eager for their breakfast, and it wasn’t long before the facetious “I-caught-a-fish-and-it-was-this-big” tales began to broadcast. But at the end of the day, photographic evidence determined the prize, a $50 Bass Pro Shops gift card, belonged to Army soldier Matt Griffith, who hoisted in a 31-and-a-half-inch striper. 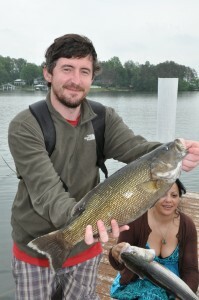 Josh Dennis, a Marine who had been medically discharged six months prior, brought an impressive 15 fish on board his boat. The final day was spent at the pistol range and archery arena. This was the telling moment. Who would be the best shot? The vets were impatient to find out. Gunnery Sgt Shawn Horsley even brought his own favorite gun. An overabundance of weapons and ammunition at the range was provided by the Smith Mountain Pistol Shooting Association. Club president, Peter Fisette, organized a comprehensive session, including a warm-up round, distance targets, nighttime competition, and distraction shooting. Matt Lutynski took the award for best marksman, which was another $50 gift card to Bass Pro Shops. 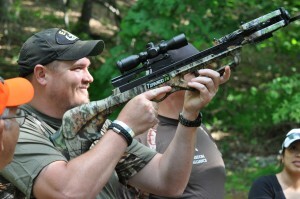 The archery match was hosted by Parker Bows representative Jim Wynn and the local Blackwater BowHunters, Inc. Shooting at three-dimensional targets, the soldiers used traditional bows as well as a variety of crossbows to achieve high scores. Their sponsors included a training session with tips and practice shots. A newly commissioned Marine lieutenant Kat Mead won the bowman competition, her prize being a brand-new Bowtech compound bow. As a surprise, the Striper Club and Mark Melius, a local fishing-rod craftsman, presented custom-built rods with top-of-the-line spinning reels to each of our 12 service members. The club will sell similar rods and donate all the proceeds to Freedom Alliance. 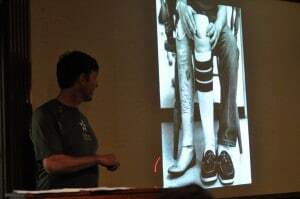 The final event was a heartfelt presentation from actor and public speaker Erik Stolhanske. Erik is known as a member of the comedic team Broken Lizard and starred as “Rabbit” in the cult comedy film Super Troopers. Born with a leg defect that made him an amputee, Erik had a special message for the soldiers, who endure various physical and psychological impairments. By sharing his own difficulties and experiences, he inspired the group to overcome their challenges. To Dan and the others, we are so grateful to have you.